Vijendra Swarup, M.D., F.A.C.C., F.H.R.S. 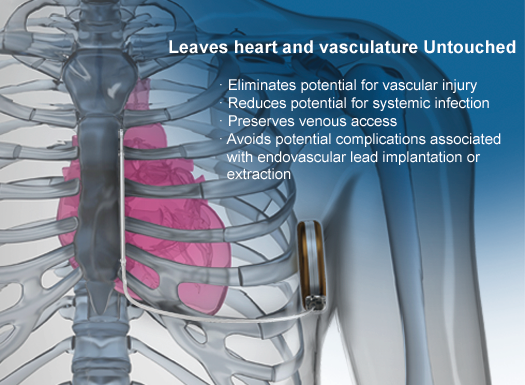 The S-ICD System is the world’s first and only subcutaneous implantable defibrillator that provides protection from sudden cardiac arrest (SCA) while leaving the heart and vasculature untouched. Like transvenous ICDs, the S-ICD System utilizes a pulse generator capable of delivering life-saving therapy. Unlike transvenous ICDs, the S-ICD System uses a subcutaneous electrode and analyzes the heart rhythm – rather than individual beats – to effectively sense, discriminate, and convert VT/VF. For years patients’ lives have been extended by implanting transvenous implantable defibrilla tors. Now the S-ICD System provides a new solution to protect patients from SCA, without touching the heart. We're here to answer any questions you may have. Contact us today! © 2019 Arizona Heart Rhythm Center. All Rights Reserved.